Disclaimer: This guide is based on our experiences and trip research only. This is NOT Lonely Planet and if you need a comprehensive guide on every inch of the place go for them. This is for those who want to know about the place. This is Ultimate to my knowledge. Also I will have the PDF after I publish the Part-2. 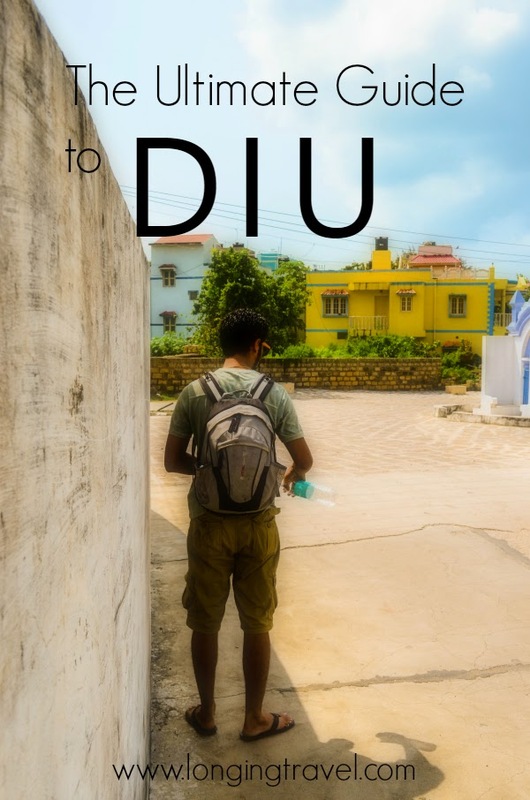 Diu usually is referred to as a part of Daman & Diu a a union territory on India which is true politically but it is VERY far from Daman. Most of the people we told about our vist asked us if we were going to Daman too. Daman happens to be nestled between Maharashtra and Gujrat while Diu is a small island just of the coast of Gujarat. It is far closer to most parts of Gujarat than to Daman. Diu is a unique place not a regular colonial town. It does not have the abandon of Goa or Pondicherry but it does have the relaxed vibe of a small beach territory. Diu has a airport which receives one flight a day coming in from Mumbai which goes back to Mumbai via Probandar. The airport in itself is a small building with check in and security area in Departures and a small arrivals. Do not expect to have your lunch at the Airport. Diu is well connected to all major cities of Gujarat and to Mumbai by bus. A day long bus journey to Mumbai can be booked for around 900 Rs from various travel agents who are scattered all around the city. Diu in itself does not have a railway station, instead it is served by Veraval which is 85 Km and a two hour bus ride from the city. Veraval can be reached by an overnight train from Ahmadabad the capital city of Gujarat. Image below shows all the trains which connect Veraval to Ahmedavad. Flights can be really expensive if you are paying with cash. Jet flight when booking a month in advance can go upto 12 K in no sale scenario. However if like us you have a few miles you can get a return flight for 1500 Rs and 10000 JP miles. If you can plan ahead look out for offers like 50% off which let us return flight for 4000 miles. Buses are available from few hundred to around a thousand one way depending on whether you choose a seat or sleeper birth in non AC bus or AC bus. Train cost varies from 300 to 1600 depending on class when coming from ahmedabad. Diu caters to all kinds of accomodation needs right from the plush on the beach resort to backpacker heaven with cheap costs and clean beds. Most of the accomodation options are lined near the Nagoa beach and Diu city center the long stretch between these is quite lonely with a few resorts sprinkled in between. It definitely makes sense to be close to one of these as well. We prefer living in the city center because it jut makes everything easier right from going out to buy breakfast to visiting the old city and monuments. Diu is no exception. Most of ht e sites are centered in and around the DIU Fort. I would recommend you to take up a place near the Museum or along the promenade. If you are looking to relax on the beach and are OK with driving to visit the other attractions you can stay near Nagoa too. We did drive to Ghoghla and found a few resorts there too but we would not recommend them as they are far from the main beaches of Diu as well as city center. We stayed here and paid 600 per night for two beds. From what I understood they also give out single beds instead of rooms but would suggest you check with them. It is one of the better accommodation options I have seen for this price. Most of the places around the promenade start up from 1500 a night. If you move towards Nagoa you can expect fares starting over 2000 a night. I do maintain that AC will not be required unless you go there in peak summer and you cannot tolerate even a bit of heat. Our afternoons were spent inside enjoying sea breeze. Please remember we stayed at only one place, other accommodation options you see detailed here are because we ate in them or searched around for them. Options listed under others are those which we heard about and researched but do not have any first hand experience with them. You might read that the place is behind Diu museum, do not go walking around to locate it it is right behind the museum building. We were excited to sleep in the church but simply could not find it until 2 days into our trip after promising 3 night stay in Herança. It is named as an Island villa which is what it is a nicely done open lobby welcomes you as you enter the gates. The lobby/restaurant opens up into a garden with a hammock. Rooms start around 2300 as per the pamphlet on the reception. This happens to be one of the good resorts near the beach. Tastefully done lobby and common areas (which is what we saw) welcome you with much needed air conditioning in the noon. You get almost all kinds of food in the city from pure vegetarian fare to sea food and from local Kathiawari food to Italian. Expecting original taste might be a bit too much unless you have a local Portuguese descent family preparing food for you. Diu food is a fusion so enjoy it. What I should be eating? As I mentioned in this pst you will save money and eat well as long as you eat Kathiawari. Gujratis are majorly vegetarians and you will find a vast variety of vegetarian food but the island character of the city will not go unnoticed with sea food offerings though they are far less than what you normally see in coastal places like Goa and Pondicherry. This was our liberation while walking from airport to the city. The prices are decent and taste is OK. We rate it high because of the chilled chach that saved us from heat on the road. Food is nice and place is clean. they have pebbled floor and you sit out in open. Liquor is not served and they specifically disallow drunks. There is a wine shop by the same name just behind the restaurant. Locate in one of the narrow lanes of the city behind the Museum this is touted as the best western/Italian food place in Diu. The place is actually someone's garden hence the garden restaurant in its name. Like most of Diu you eat outside under lights which can be a problem due to insects. Food is nice but I wouldn't quote it as out of this world, though I just had some pasta. Prices are average but you will find them a bit higher if you have been eating local in one of the places along th epromenade. Located on the promenade this is famous as the family dining place and its attraction seems to originate from south Indian food options. Food is good like most of the other food places.We had a breakfast and dinner at the place, which made me notice that the coffee cups and kettle were not one of the best ones I have seen. It is a bit pricier compared to other places nearby. do try the gujrati thali which is what we found to be the best deal of all but stay away from noodles they were too oily and salty for my taste. This is another one of the places which serves good food along the promenade at decent prices. Food is good, the place is clean and service is quick. It is across the road from the government wine shop but does not serve liquor. This is the place where we spent two of our afternoons and its proximity to airport made it the perfect place to have our last meal in Diu. Its food also made the decision easy. Do try spicy potatoes, though a bit oily we found them to be a perfect companion to our drinks. Along with stuffed tomato and cucumber mustard raita this was our best lunch in Diu. Though the prices are a bit high compare to last few options the place has an upmarket setting and you pay for that too. the resort boasts of a roof top restaurant and bar but it was closed maybe because it was not really the peak season for the resort. Being a posh resort the restaurant was clean and prices reflected its resorty nature with everything almost 1.5 times other places. But you get to sit in air conditioned restaurant which is something you will love in the afternoon. We had our brunch and food did not disappoint, you will be seated with a view of the pool area or the entrance. There are no sea views though as the restaurant is on the ground floor. Do add your own tips and suggestions in the comments below I would love to incorporate it in the guide and Part 2 will be out soon.